SUMMARY: To buy or fix or neither. 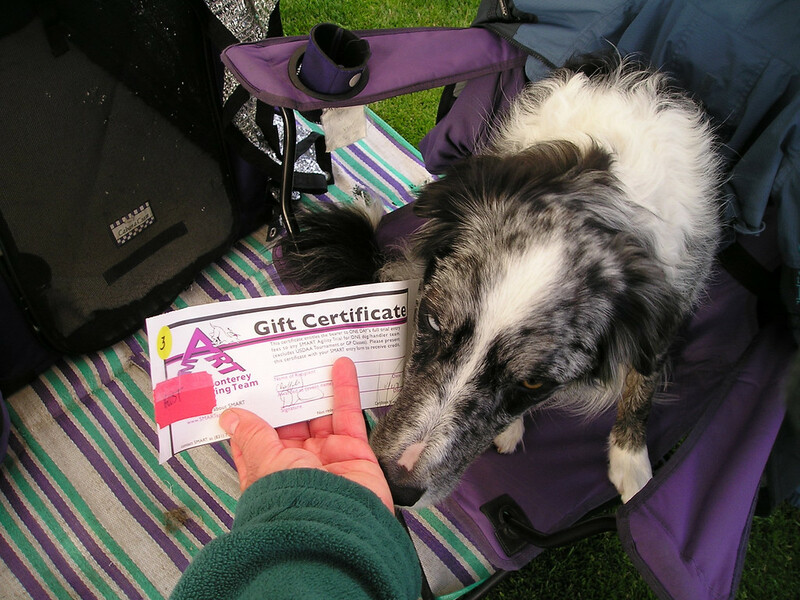 Wayyyy back in 2001 when I got my agility van, my 3rd agility dog, my agility house, and my agility canopy, it seemed like about the time to fill in the gaps in my agility collection. So I bought my own camcorder. It was fancy-pants one; the feature I really wanted was that it would also use the old tapes from the video camera I'd been borrowing from my sister. I used the camcorder less and less often. It's bulky (by today's standards), I have to find someone available before each run to videotape, I have to explain how it works. A pain. So mostly I didn't. Back in '05 or '06, when I attended the CPE National Championships in Elk Grove, I pulled it out to videotape everything--and it wouldn't work. So there was Tika racking up the 1st places, and I have no video of that. It cost me a huge amount of $ to get it repaired, and I vowed I'd use it to justify the expense. But, once again, my usage dribbled off. So, fast forward (oh, yeah, another thing I used, plus rewind) to just this past spring, when I decided that I really needed more tapes of my runs with Boost to help me figure out what I'm doing right or wrong, not to mention just having mementos of my runs. And something fun to post to my blogs. Anyhoooo-- I got the camera out first thing that particular Saturday morning, checked to be sure it worked, handed it to someone, got one run done, and then it crapped out. I can't find a local shop who'll take it. I'm supposed to send it in to Sony for repair, with a minimum $271 fee, plus parts and possibly additional labor. Sheesh! Nowadays, I can get a whole new camcorder for that! OK, sure, there are professionals videotaping at trials, but at, say, $8/run *minimum*, for 2 dogs and 5 runs a day, that's $160 for one weekend! Obviously some people have that kind of money, but not in my budget. I've bought a few from time to time and they're great. But. Repair? Means I can still use the tapes I've got, and can play them back to be able to convert to VCR or DVD. Plus I hate just tossing something like that if it's repairable. But--$271+postage+insurance+parts? Yikes. Buy a flip video. Have used a couple. AMAZINGLY convenient; can slip into your pocket, plus there's basically one red button in the middle that you push to record. How easy is that? But they seem to work only off internal memory, limiting them to 1 to 4 hours and then you have to offload onto a computer. And their zoom is awful; only about 2x. I noticed right away that that's not very helpful for big agility rings. But from low $100s for 1-2 hours, $250ish for 4 hours. Cheap! Would I use it more because it's so convenient? 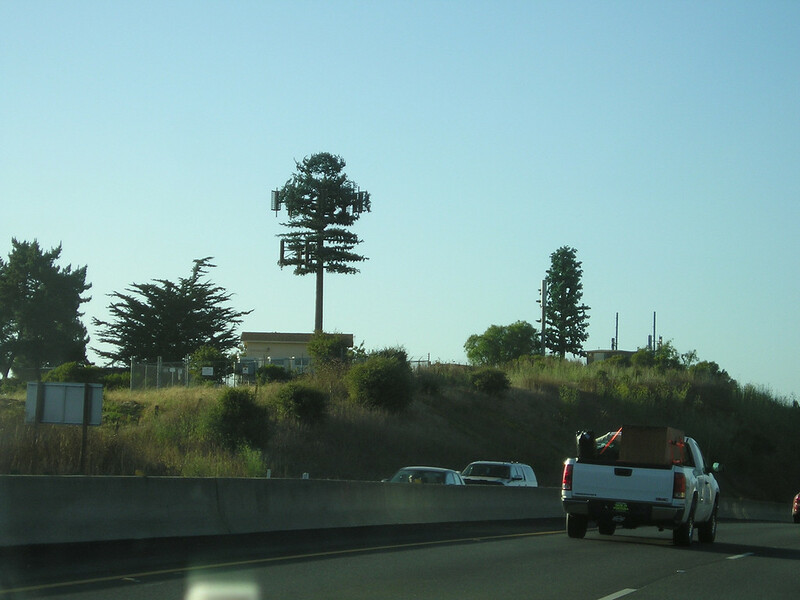 Or would I hate it because I can't see what's going on for lack of zoom and for really low-quality video? Buy an HD camcorder. Have ruled this out: They're still very expensive, I don't have an HD tv and am not likely to get one, and I'm not making professional movies, just mostly things to play on my computer or tv sometimes. Buy a regular quality camcorder. Image quality isn't as nice as HD, but per Consumer Reports, even the cheapest ones have obviously better quality than the priciest flips. Can get them to use tapes (probably same ones I've been using--bonus, could still play my old tapes), or memory cards (which aren't cheap--like what digital cameras use). Looks like I can get a decent one for $250-$350. Do nothing, as I tend to stop using it over time. SUMMARY: A little thing from class Tuesday night. This sketch is drawn from memory a day after class.Not on this drawing: #9 was in a straight path from #8 about 20 feet further on. It demonstrated an interesting behavior on the part of most of the dogs. 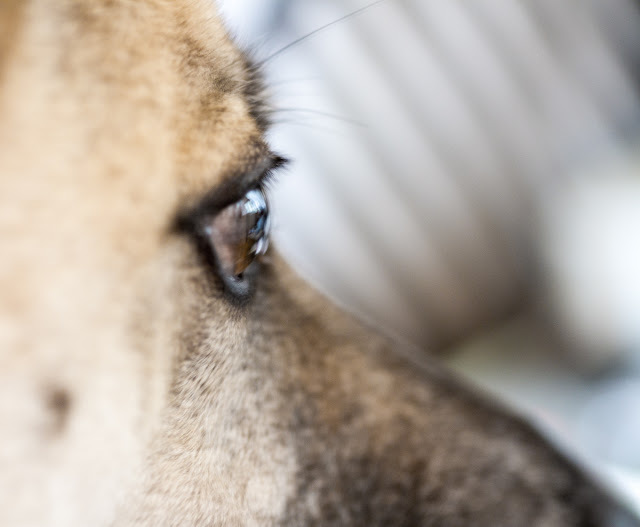 Push the dog out slightly to get him around the back side of 4 and rfp and/or hold still briefly to be sure that you are anchoring him to pull into 5 (not go over 2). Here's the interesting thing. Most of us completed our 270 from 3 to 4 right on the wing of 4 and then instinctively ran parallel to the tunnel. This not only put us in a bad position to get the dog over 6 to 7, it also gave the dog the info that you were right with him, running parallel with him (the dotted line), so the dogs tended to blast straight out of the tunnel (dotted line). 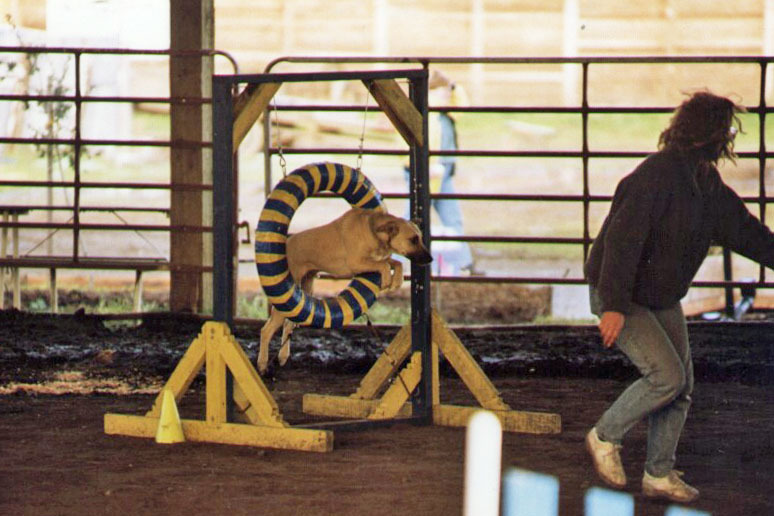 If, however, you stayed as close to 3 as possible to push the dog out over 4, then it not only gave you more leverage in pulling the dog to the tunnel, but it also meant that when you turned and ran towards the *left* side of 6, the dog could see before he went into the tunnel that you were a good maybe 8 or 10 feet off to his left (dashed line), so when he came out of the tunnel, he was more inclined to turn to his left to see where you were (dashed line). This both put you in the ideal location for a serp and gave the dog a tighter turn to be able to take it successfully. Thanks, Nancy, for figuring this out for us! SUMMARY: Right front foot not happy. Sometime between Monday morning and monday afternoon, Tika's right front foot became sore. That's about all I can tell you about it. I didn't see anything happen. I don't find any specific injuries. It doesn't bother her all the time: For example, she'll run out to the yard, grab her toy, bounce playfully a few times, then yelp and come limping. Twenty minutes later, she'll be blasting full speed across the yard after a squirrel. Couple of hours later, gets excited because I'm getting the leashes out, dances around and around, then suddenly yelps and is limping. Like that. Last winter, we were out for several weeks for rest because of the little toe on her left front foot. I'm disinclined to spend money on a vet visit unless it gets worse or doesn't go away. At least, thank goodness, we have no more trials scheduled until the end of August. So I left her home tonight with the renter while I took Boost to class. Where, of course, her Aframe that fell apart over the weekend was perfect. But also the usual knocking bars, not wanting to come in to me on jumps, not liking rear crosses... so much to work on, so little time! This could be interesting--in hopefully not too bad an interesting way. Something I ate, or inhaled, or was inserted into me by alien probes, started disagreeing with me late thursday evening (after I had written and preposted my last blog entry). I tossed and turned for hours, not feeling ill, just twitchy, like one might with too much caffeine (I'd had none). Finally rose at 3 a.m., in the mood for bread and water--made it more palatable by turning the bread into toast and water into mint herbal tea. Halfway through my snack, everything in my system abruptly decided to start coming out. Over and over and over for hours. Got a couple of hours of sleep finally between about 7 and 9 a.m., and then it continued, and worse again after I tried a light breakfast. I was supposed to join the Bay Teamers setting up the trial site at 2:00, but it wasn't until 4:00 that things had settled down enough to where I could safely be away from Critical Facilities for at least half an hour. Then boldly loaded the beasts into MUTT MVR and drove on down to San Martin, sipping water on the way. Everything was fine. 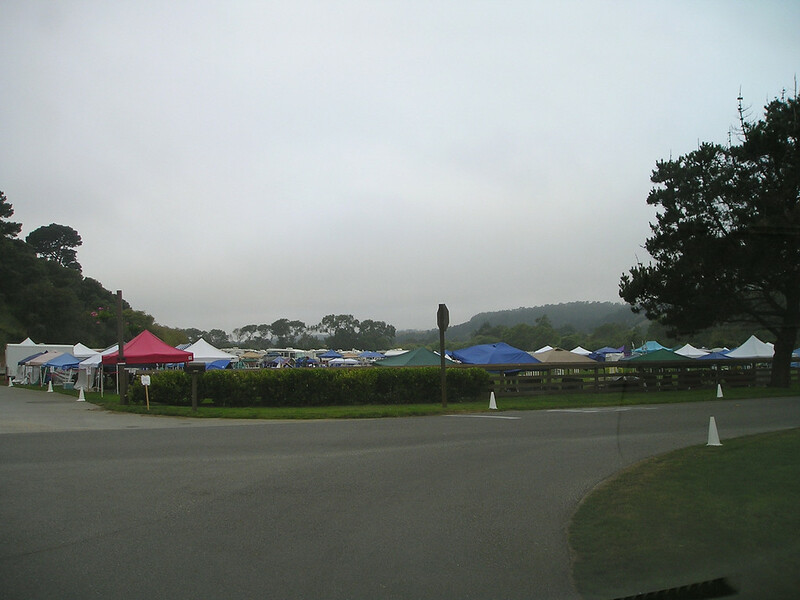 Surprisingly, I was still able to help set up, as apparently the site hadn't been ready at 2:00 as promised, so people stood around until 4:00 and were still setting up when I arrived. I helped, set up my stuff for tomorrow, let the Merle Girls out for a walk and visit, chatted with friends about tunnel repair, and everything was fine. 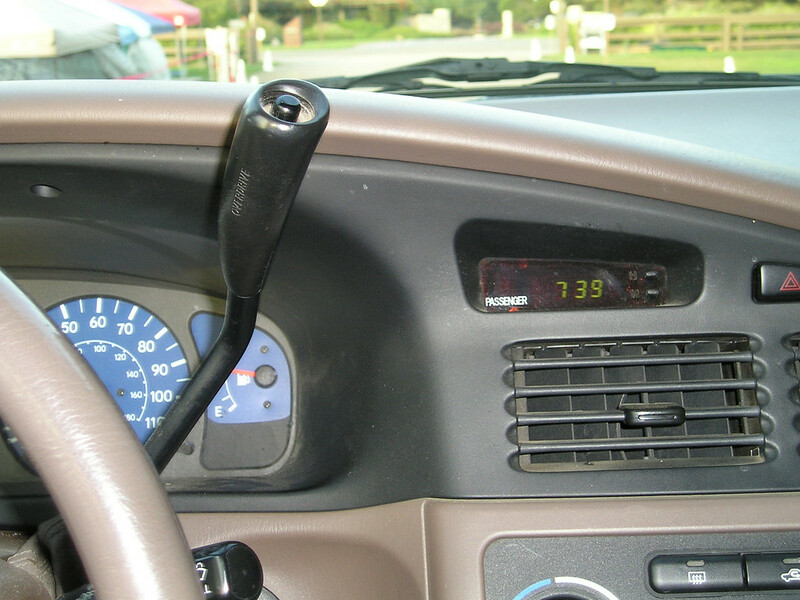 Drove home again, finishing my 16-oz bottle of water; everything stayed fine. So, around 6:30, starting to feel just a tad peckish, I had some toast and lemon herbal tea. Half an hour later, started in on a banana. None of which apparently pleased my innards; it's been back & forth to the loo ever since. I know you wanted to know all that. But I say all that to point out that I've had about 2 hours of sleep, nothing to eat that's stayed in place for going on 24 hours, and I'm supposed to be doing agility all weekend. I'm assuming it's something I ate and isn't contagious. But now my stuff is set up down there so I have to go. And I paid my entry fee and hate to lose it. Well, maybe if I just don't eat anything all weekend. Assuming I can get some sleep tonight. About to go upstairs and find out. SUMMARY: Maybe my only CPE for this year. There is SO much USDAA available now, and I am trying SO hard to cut back on weekends in agility, that there's not enough room for CPE, too. Which is too bad--means Tika will probably never get her C-ATE and Boost will never get her C-ATCH. If we keep up with just one CPE trial a year, I mean. But this weekend, it's a Bay Team trial, and it's pretty close to my house; less than half an hour away. Yay! 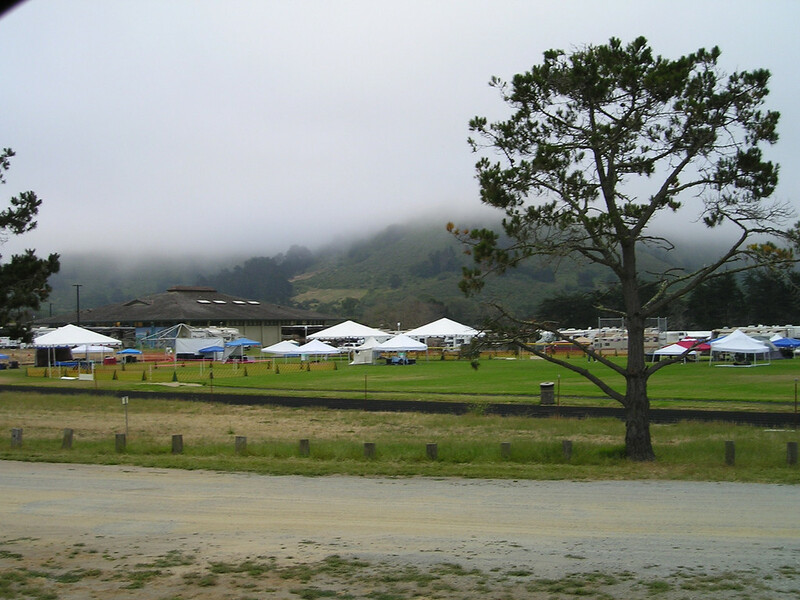 In the covered horse arena in San Martin where Remington and I attended our first-ever agility trial, and where he earned Q ribbons, thereby hooking me, despite the abysmal storm and mud on that first Saturday in January 1996. Fortunately I returned that Sunday and it was a lovely day. There's been no agility there since, and I've had no reason to go back. It'll be interesting to see whether it brings back memories that I haven't already brought back many times. ...14 and a half years ago! No wonder I felt more spry when I started. Note your basic cross-trainer shoes (no cleats), the handler's stiff arm pointing the way, and the dog-awful mud glistening along the fence--and covering the equipment and my jeans... Oh, jeez, and our old original wood-frame tire! Wow! I'm looking forward to what I hope will be a relaxing weekend, despite probably being overworked at the score table--seems to happen at CPE trials, and despite temps that are supposed to be well into the 90s F (32+ C). I'm particularly looking forward to Full House--my favorite CPE game, like a free-for-all gathering points. Is it no wonder that this is the only class in which Boost has advanced to Level C (the highest level)? For the first time ever, Tika and Boost will be competing against each other, in the two Full House classes this weekend, because for the first time in CPE I've moved Tika down to 20" instead of letting her go at 24". And although Boost is eligible straight up for 16", I'll keep her at 20" as long as she has to jump 22" in USDAA. 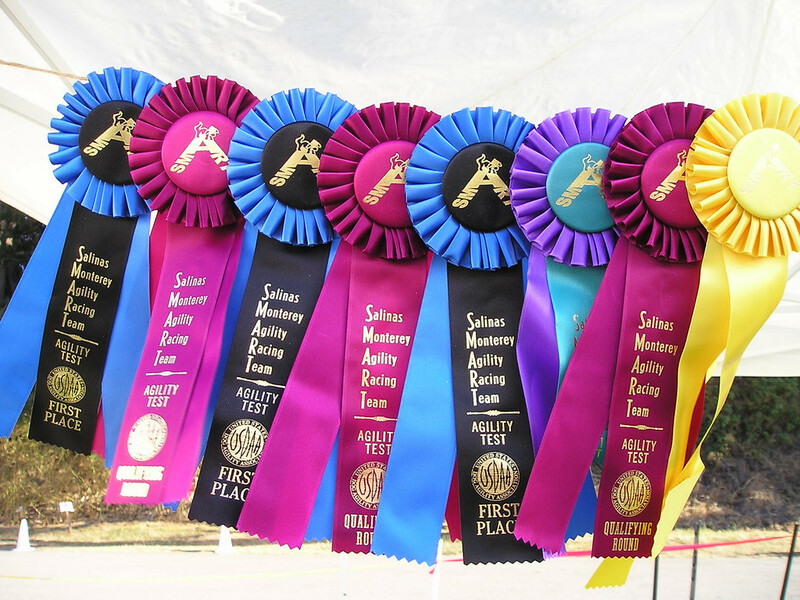 My hope is to pick up a bunch of ribbons for both dogs, but particularly Hi C-Era Interstellar Propulsion herself, to salve my wounded pride at her usual iffy showing at USDAA trials. CPE is just excellent for bringing home ribbons, although some excellent competition awaits us this weekend; for example, Chaps (same dog who often beats us in USDAA unless we're teamed together) will be there. Don't remember the others, but in looking at the running order, I saw some definitely high-level competitors. So it won't be a cakewalk! But at least it won't be a mudwalk. I hope. SUMMARY: Lots of trials, classes, and intense practice help one's weight and health, plus save unwanted dogs and improve the economy. Twenty-eight states saw their obesity rates rise in the past year, according to research by the Trust for America's Health. Mississippi had the highest rank for a sixth year in a row -- with 33.8 percent of the adult population rated obese -- followed by Alabama and Tennessee (both 31.6 percent). Nearly all the top 10 states were in the South. The healthiest states were concentrated in the Northeast and West. Colorado had the lowest obesity rate at 19.1 percent. Scary. But Colorado rocks! (I wonder if that's why they call them the Rockies?) California is just 9 places higher than Colorado. I found that info by browsing around and following links on the Trust for America's Health site. I know that my weight is more stable--or even dropping--when i'm doing a lot of agility. And, although there are overweight or obese people in agility (Full disclosure: I'm on the borderline of the BMI "overweight" category), there aren't many, and it seems to me that there is a much larger proportion of obviously ideally-weighted people than you'd find at your average shopping center. So, to solve the obesity problem: Everyone in those southern states should take up dog agility! It would find homes for all those millions of dogs currently in shelters or foster homes (or being euthanized) and pour money into the economy for all those vendors and judges and agility sites and equipment manufacturers, who would then spend it on other goods and services--so we could fix the economy, too! I'm sure there are many other similar large-scale benefits like that. SUMMARY: Plastic wrap:Yum! and amazing ADCH and PF vs Ch. 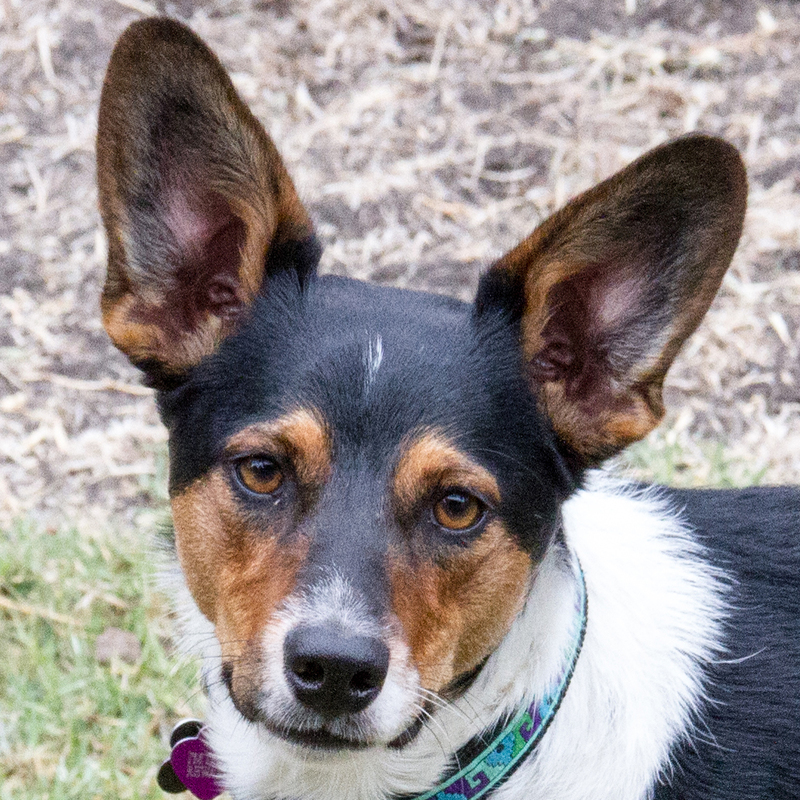 One thing you need to know about Tika: When I toss the toy for the dogs, Tika likes to scoop it up and keep on going in a straight line until something possibly interesting or possibly inconvenient (e.g., a fence) appears before her. Then she drops the toy. Then Boost brings it back. If the object was interesting, Tika might not follow Boost back immediately, but does so usually before I can throw the toy again. 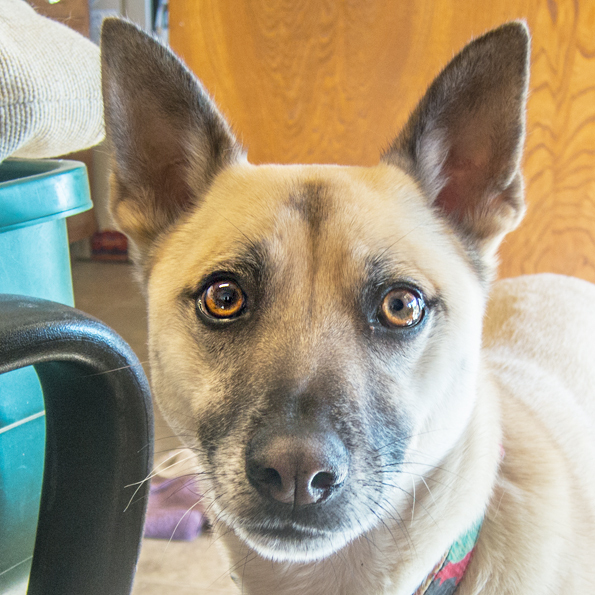 The other thing you need to know about Tika is that she is a chow hound beyond belief. Off leash, she seems happiest when sniffing around in the grass, or around other people's canopies, for lost molecules of food. 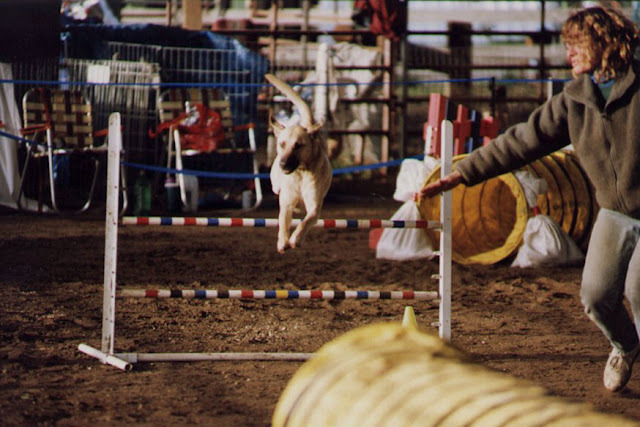 She has veered off in the middle of agility runs to go out to the edge of the ring to scoop up a morsel that no human could have detected. So, Sunday morning, there's this huge beautiful lawn where we can warm up our dogs. I toss the frisbee, Tika scoops it up and runs till she gets to a row of canopies (no one there yet, it's early), drops the frisbee, and starts sniffing. I call her name once (I try not to say "Come" unless I know I can enforce it) and don't worry too much about it when she doesn't respond. Sniff sniff sniff, while Boost brings me the frisbee. Then suddenly, Tika dives under the lowered canopy, grabs something large, and starts chomping. I yell various useless things, tell Boost to "down", and run as fast as I can in Tika's direction. It's a big field. As I get closer, I can see that she has one of the huge sandwiches that Quail Lodge provided us for lunch--huge!--and still mostly wrapped in plastic wrap! Crap! I yell other things, like NO! and DROP IT! (neither of which Tika understands, I can guarantee that) and COME! (which she knows what it's supposed to mean but doesn't care enough), but she understands my rapid approach and tone of voice, so flees just far enough away from me so that she can stop and swallow the whoooole thing, and I see the dangling plastic wrap disappear inside my dog. That's a lot of plastic wrap. 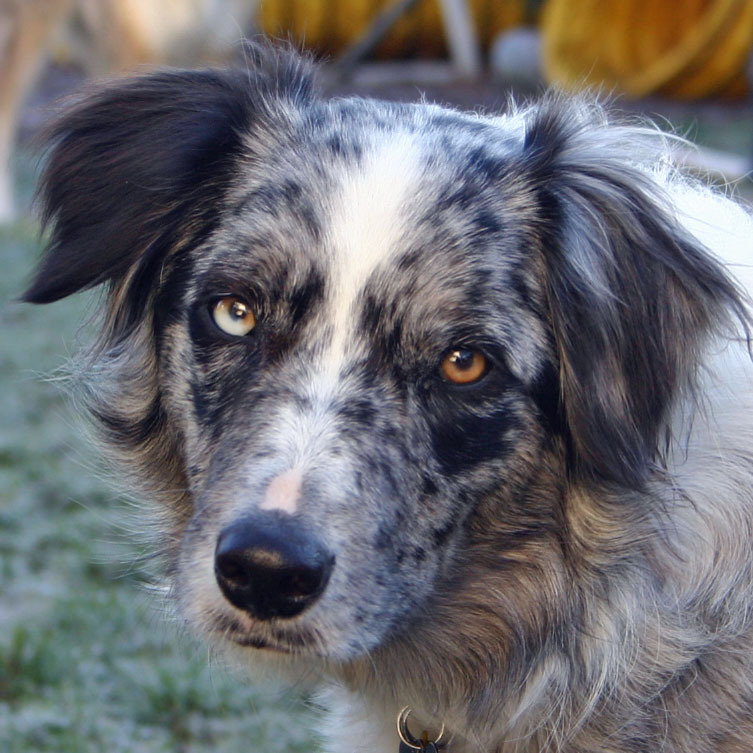 An agility competitor who's also a vet makes a casual comment about Tika not needing dinner today. I confirm with her that I can probably not worry about the plastic, since Tika's a large dog and her system can probably deal with it, but just to be aware if she's not producing poop, starts vomiting, or stops eating. So I don't worry about it. Tika shows no ill signs all day. Monday, no sign of plastic wrap, and everything else seems to be working normally. This morning, when I went out for our morning play session, there was the plastic wrap. Whew! So I probably should have signed up for Susan Garrett's brand new online course, "The Five Minute Formula for a Perfect Recall". I've listened to her video about the course, and it sounds great, but that wasn't in my budget and I have various susan garrett (and other) games related to recalls already that I only pay attention to once in a while (and when I do, the recall improves). So maybe later. And hope that meanwhile Tika doesn't kill herself in some way where a reliable recall would really have helped. Plus I'm sure registration is closed by now. But it's the budget that's the biggest issue at the moment. 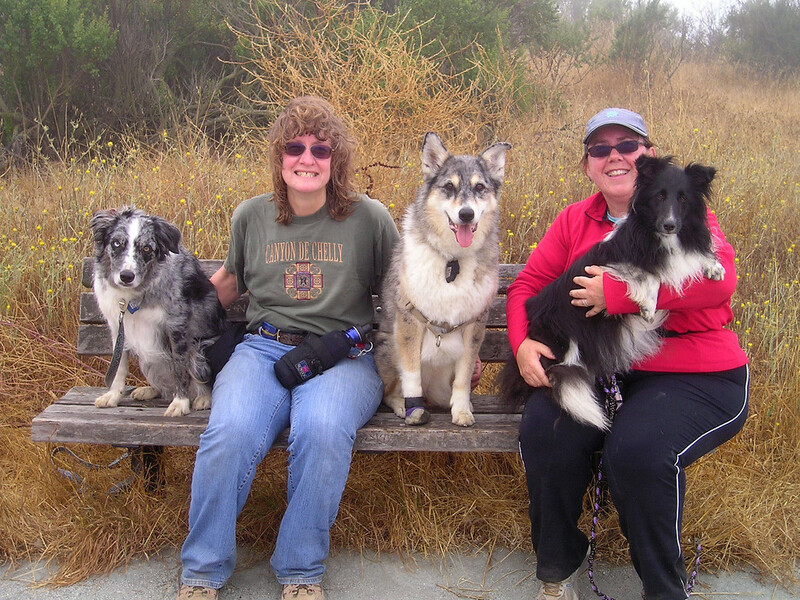 Friend Cheri and her Border Collie Jeepers earned their ADCH this weekend. 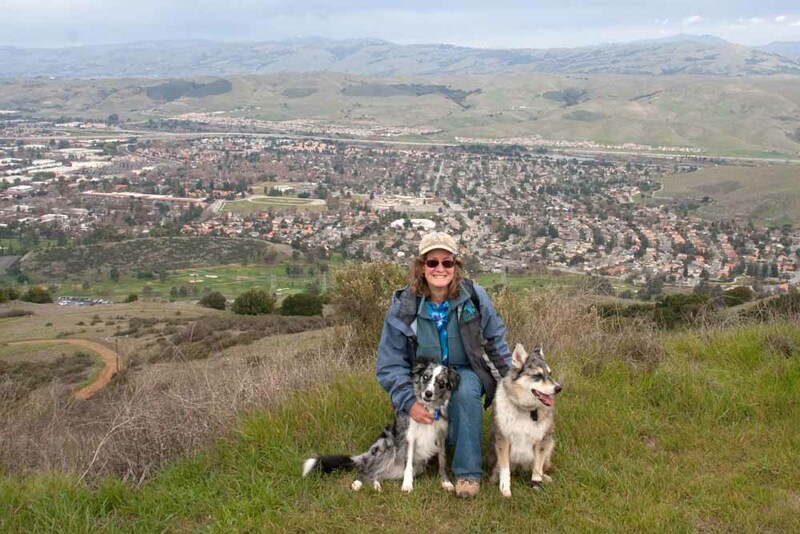 I can still remember so clearly when they had their first trial coming up, and Cheri was so worried that she'd embarrass herself with her new dog and all her training mistakes. ...No wonder I can remember it clearly, because that was JUST 10 MONTHS AGO! They've been in Masters for exactly 3 months. Even Tika's performance ADCH, which she got very quickly as an experienced and speedy dog, took 6 months after her last class moved from Championship to Performance. There were probably fewer days of trials in those 6 months than there have been in the last 3, but still--C&J are a Qing machine! Congratulations to an awesome team! Sometimes I feel odd about Tika being in Performance when she was still doing reasonably well in Championship. But then I remind myself that I did it because of her recurring soreness and arthritis, and anyway, now she *is* 9 and a half. Dog participation in our USDAA trials drops off noticeably at 7 years and again pretty sharply at about 10 years. So she's getting up there. It is so much fun for me to be winning classes and top ten points; we'd have never been in the Top Ten in the Championship program and we almost never won classes there. And then I get put in my place by a dog like the super-accelerated Daz who whupped our butts in several classes this last weekend. I don't know how old Daz is or why he's in performance, but we've got our work cut out for us if we see much of him/her. Anyway, I thought I'd compare Tika's wins from this weekend with the Championship 26" dogs to see how she'd have placed (assuming she'd have had the same speed at 26" rather than 22" AND kept her bars up, either of which I dunno). Saturday jumpers: Won P3 22". In champion 26", would've been 3rd of 20 or so. Saturday Snooker: Won P3 22" and SuperQ. In Ch 26", would've been 4th of 20ish, but there were only 3 SuperQs (we did that a lot, one out of SuperQ position). Saturday Gamblers: Won P3 22". In Ch 26", would've been 2nd place. Sunday Standard: Won P3 22". In Ch 26", would've been merely 5th. Sunday Jumpers: Won P3 22" (with a faceplant and really wide turns). In Ch 26", would've been a lowly 10th of 20 dogs. Saturday Steeplechase Round 1: Placed 3rd (behind Daz and Chaps). In Ch 26"--here's one of the weird disconnects--she'd have placed 2nd! 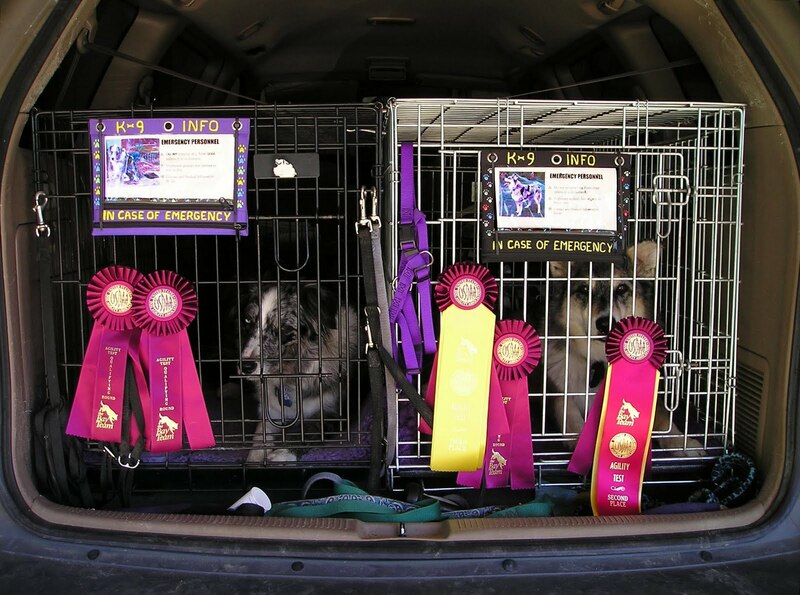 Round 2: Placed 3rd (same dogs). In Ch 26"--she'd have placed 2nd also! So, anyway, we're still doing well in comparison. Mojo score! SUMMARY: USDAA trial second day. Tika won Jumpers again (by a mere .02 seconds) for another 5 Top Ten points, putting us I'd say with 100% confidence in the Top Ten for Jumpers for 2010. In Gamblers, she flew off the dogwalk, costing us 5 points, turned way wide twice when I was trying to call her in, and that's all it took so that, when her 2nd teeter was descending, the whistle blew and the judge didn't give us those 5 points, either. So instead of winning--not even in the placements. Although she got the gamble nicely, so did "everyone else" in her group. In Snooker, well crap, *I* thought I was doing a tight wrap to a 7-point obstacle and *she* thought she was going straight ahead to a 4-point obstacle, and since she was in better communication with her feet than I was, the 4-pointer won, again keeping us out of the placements (although she got all the way through the course) because "everyone else" in her group got the full 51 total points. But she did win Standard today, so, except for Jumpers, she reversed her well-done courses from yesterday. In Steeplechase round 2, we all finished in exactly the same order we placed in the first round, so we came home with a 3rd place and $12. To remind myself of how badly my new quest for Top Ten points has skewed my agility-success world view, I've been feeling like this weekend was decent but not great because Tika and I missed so many opportunities for Top Ten points, mostly with just one stupid thing here or there. It wasn't until I got home this evening and entered it all into the database that I did a double-take and had to go back and check: Tika actually Qed 9 out of 10 runs this weekend! So, really, it was a pretty good weekend. 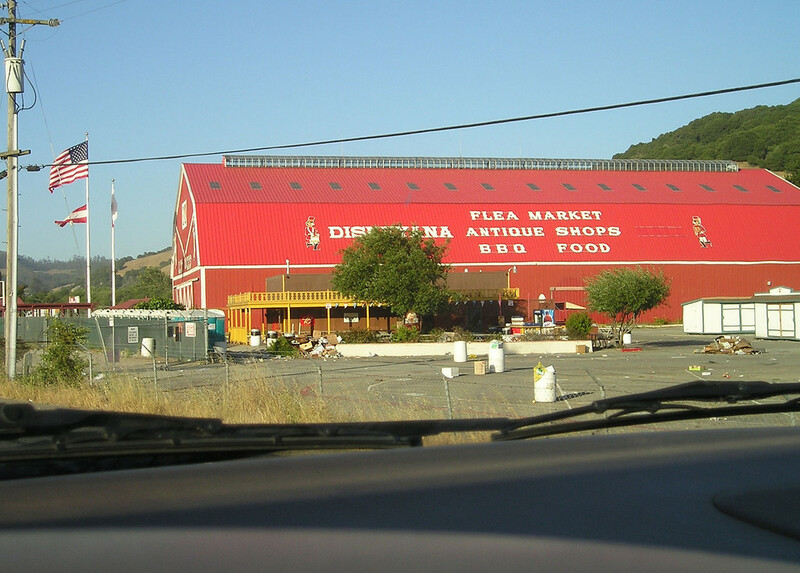 ...and the big red barn, whose flea markets and sales are often the cause of major backups coming home, but didn't seem to be anything going on there today. And, once again, we're home, I'm tired, dogs are not, and it's now bedtime. SUMMARY: USDAA trial first day. Oh, how I hate to get up in the morrrrrrrning! Oh, how I'd love to remain in bed! But we got on the road in record time and, after an 85-minute drive, arrived at the Quail Lodge/Golf mecca agility site. A friend saved an ideal place for me, right alongside the entry road, so I could just toss everything out of MUTT MVR right there, go park the van, and then come back and set up. The morning started with foggy overcast--had to use my wipers on full on the way down--but it burned off quickly and we had perfect sunshine on the most perfect lawn I've ever seen that doesn't have a cup and a flag in the middle of it. And a cold marine wind that made the ambient temperature just about right. 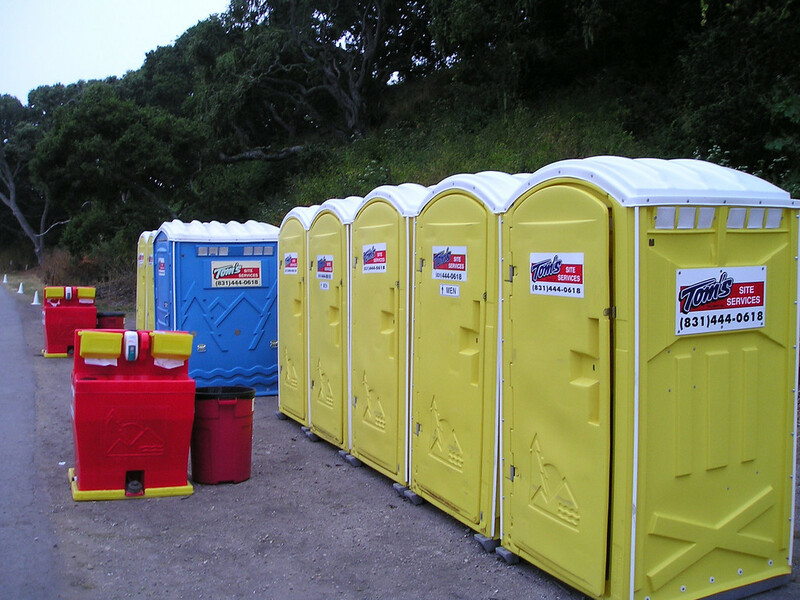 Even the portapotties were in bright, cheery, sunny colors, none of this gloomy blue bathroom portosan color that you usually see. 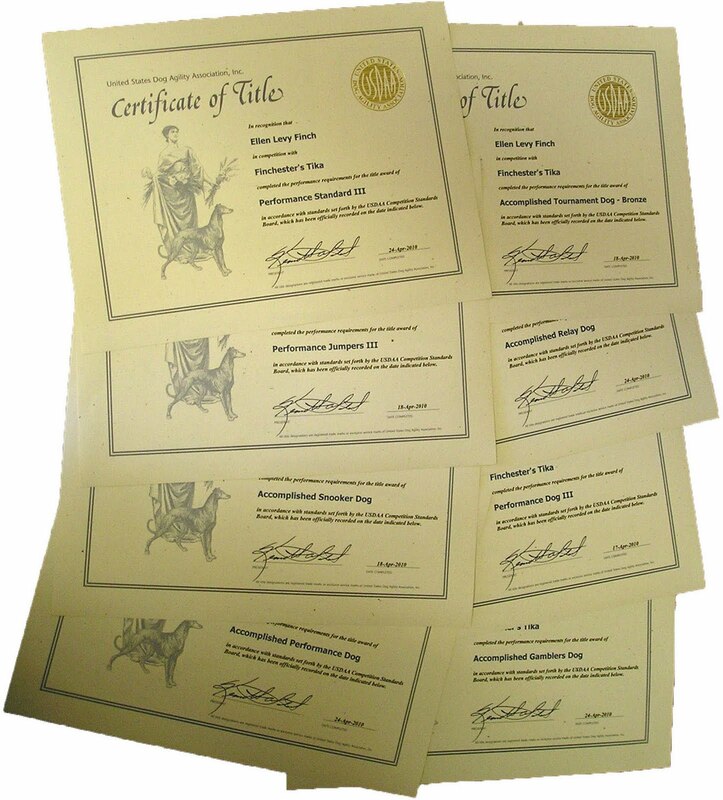 Anyway--Boost started the day in style, by Qing in Standard on a course in which only 9 of 53 dogs in her height Qed! (25 Eliminated.) We placed 8th--a little issue with not keeping the elbows down on the table, although we probably lost only a few seconds on it this time. So if BOOST and I can do it, then Supertika and I surely can, right? Well--yah, lovely on everything except going from the table to the tunnel, where she cut behind me and went into the wrong end. My feet, hands, shoulders, everything were pointing to the correct end. However, in fact, I could've solved the problem by just hanging back 2 steps and running with her instead of assuming she'd come where I was pointing. Dang. Is it going to be another one of those days? So E for Teek in standard. No top ten points for YOU! Curseeees! Next up: Steeplechase. So what happened to the Boostergirl who ran standard with me? What a disaster! Grand Prix came after that. Boost's run wasn't as much of a disaster as Steeplechase, but we E'ed on refusals--not as bad as it sounds: skipped a weave pole and had to come back for it, and then massive confusion on one jump for 2 refusals on the same jump. Otherwise most of it looked pretty darned good. Tika again was smooth in the Grand Prix but felt slower than recent weekends, and she--yes--finished 3rd (out of 8 dogs), with a time of 38.67, 1.3 seconds behind Daz and .33 seconds behind Chaps. Yeah well dang, so it's going to be one of THESE kinds of days instead, is it? But at least we're Qing and placing. Still, I could've really used the Standard Top Ten points--T10 is what we're here for! Gamblers picked up a bit. Boost had a lovely opening, although she knocked one bar and ran past one, AND she got the gamble without a single hesitation. (It was very similar to a gamble we'd worked on in the back yard this week, so, hey, practice DOES help!) 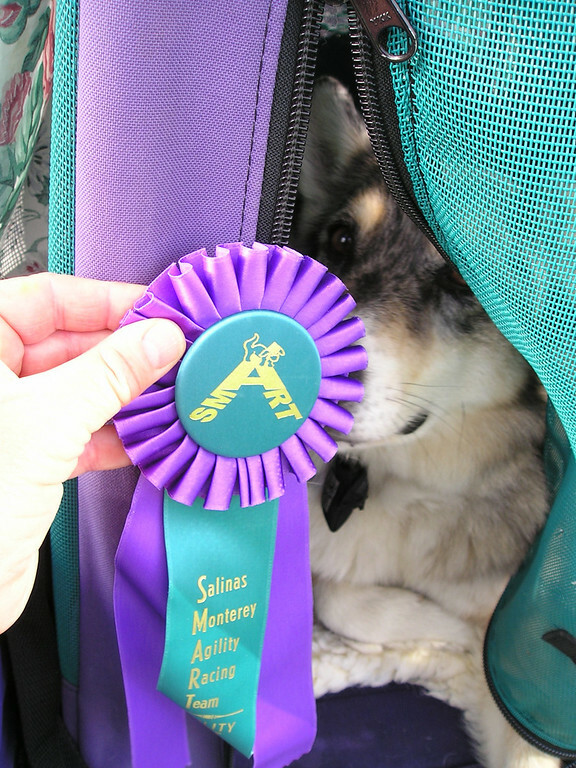 She placed 12th of 59 dogs--those extra 2 points would've maybe put her in the ribbons. But I was pleased anyway. Tika knocked a bar in her Gamblers opening, and BARELY got toenails into two Aframe contacts--all scary in this crowd, but she aced the gamble, and I apparently aced my planning because she was into the gamble just a fraction of a second after the whistle blew. Turns out it that was our saving grace--three of us got the same number of points (danged knocked bar) but we won on time. So 1st place of 8 and 5 Top Ten points! Yeeha! Then Snooker. Boost bobbled her way through a moderatlely complex opening--actually most of it was pretty good, but we probably wasted time in a couple of places that would've kept us from completely the whole course anyway. But it didn't matter, as she knocked bar #3 in the closing, keeping us out of even Qing range. Tika got through the same opening, looking considerably perkier (I think she likes my heightened excitement in Snooker, although I try to remain calm)--although her Aframe was amazingly iffy. AND she made it all the way through the closing, although my heart almost stopped when I was SURE she had missed the Aframe contact again--but no, then the judge called the point value and we were safe! After the 1st 11 dogs, we were in first place, but had to wait an hour before the last 2 dogs ran to know whether we actually won and got a Super-Q (we did! and for 7 Top Ten points because there were 13 dogs). Then came Jumpers. Agggghhhh, Boost's first half of the course was gorgeous and fast. Her second half of the course was gorgeous and fast. It was that jump in the middle that she wouldn't come in to me over, instead running past, full sped, LOOKING AT ME DAGNABBIT THE WHOLE TIME and took an off-course jump. Eh, who wants any danged Jumpers Qs anyway. Tika, whose favorite class really is probably jumpers, because there are no pesky contacts, aced it, winning (1st out of 10, for 5 top ten points--dang, one dog scratched or that'd have been 7 points. But actually we've got so many in Jumpers now that I think we're home free in this event). Boost, however, redeemed herself by winning a free day's entry in the raffle. Seems to me that Boost has been my most successful dog in raffle winnings. And I'm likin' it. So it was arrive home, stash cooler ice & drinks for tomorrow, load photos off camera, label & upload them, shower, dinner, dry hair, type up blog... OMG it's 11 already?!?! Well, you know what song I'll be singing in the morning tomorrow when the alarm goes off at 5:00. SUMMARY: First in a series comparing my 1996 gear to my 2010 gear, and transitions between. I got to thinking about all the Dog Stuff that I now own, carry around with me without thinking about it, and/or load into the car routinely, that back in 1995 I'd never thought about that, in 1996 when I attended my first competitions, looked entirely different from what it looks like now. My list of topics is so long, I think I'll break it into several posts over the next few days. This is Part 1. This could be a continuing series as I think of things I've got now but didn't then, had then but don't know, or tried in between and abandoned. 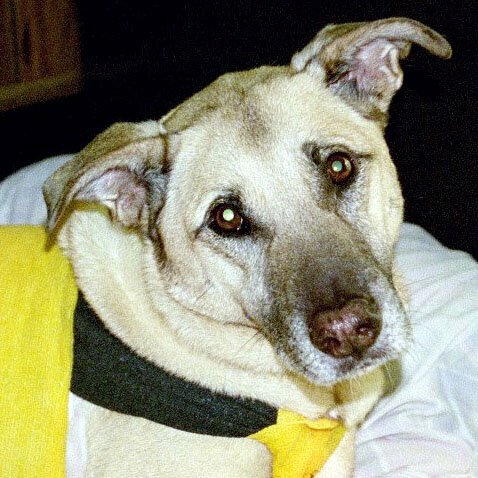 Then--Just one, Remington, my pet dog who made a decent agility dog some of the time. 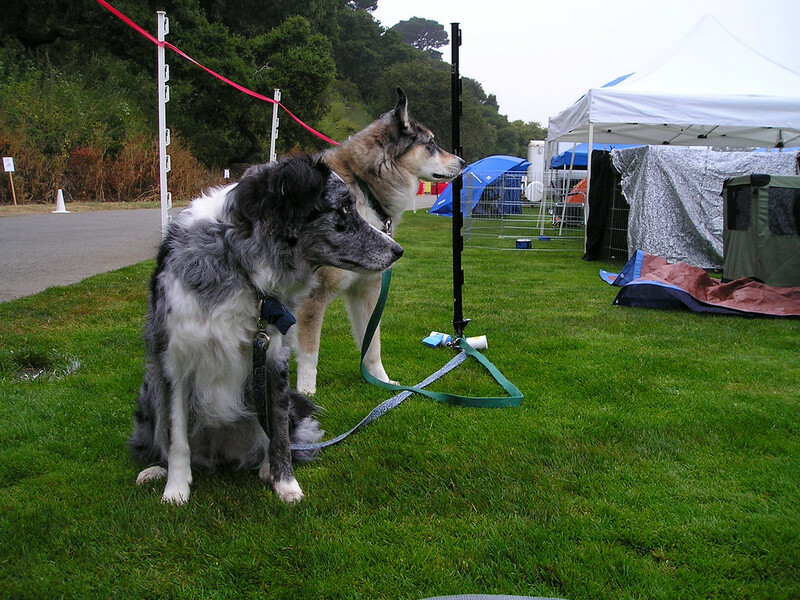 Now--Two dogs (Tika and Boost), both obtained specifically with agility in mind. Then--My grown-up luxury sedan, my four-door Acura Legend. 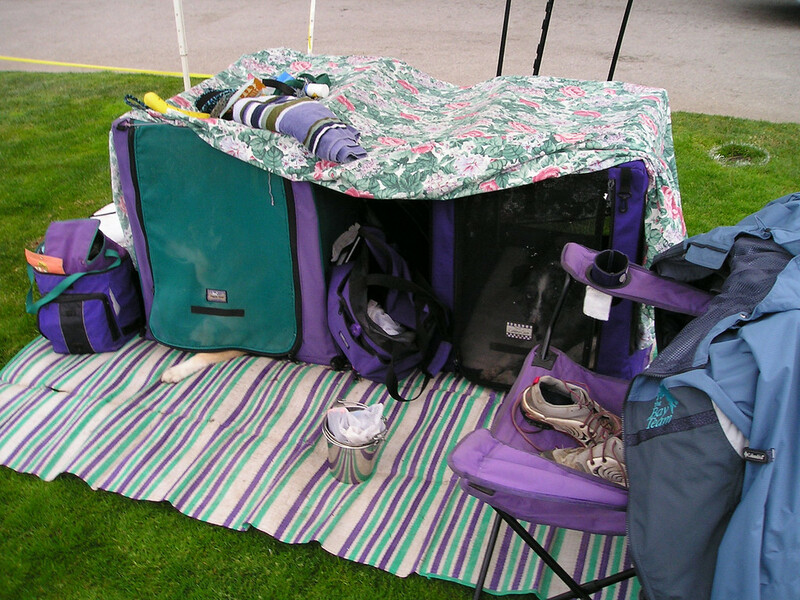 I got an amazing amount of stuff into it, but when I decided I wanted a 3rd dog and a canopy, it was right out. Now--Minivan, MUTT MVR. I bought it for only one reason: Hauling dogs and their gear around. Then--Rem sat in the front seat and watched the world go by. After a year or so of that, I bought seatbelt harnesses at the SPCA. They proved to be pretty flimsy, in retrospect. 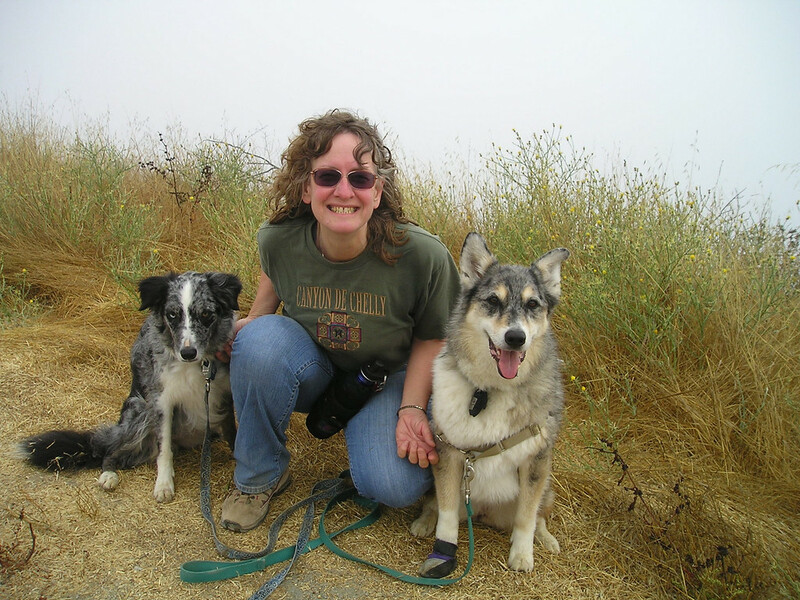 When I read friend Holly's post on good harnesses, I bought two sturdy ones (for Rem and Jake at that time). Now--When I got my 3rd dog (Tika) and my minivan, she began riding in a crate right away. 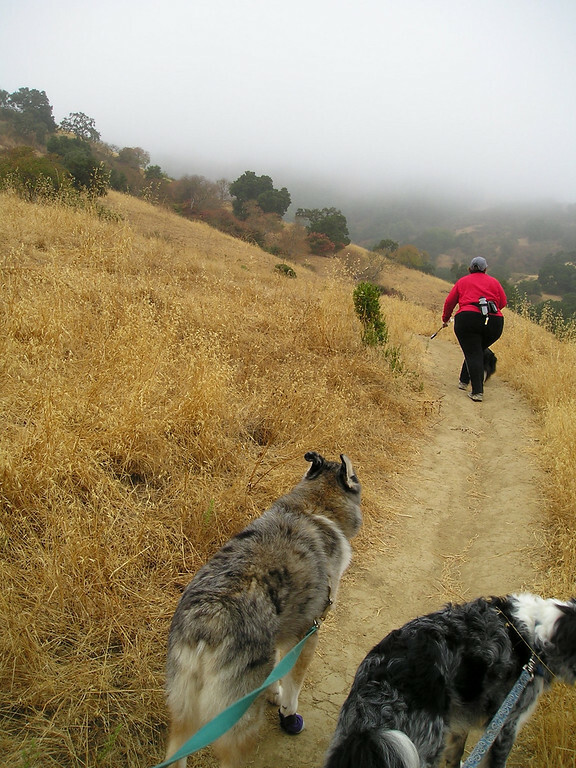 Jake and Rem continued using their harnesses until they passed away. Boost and Tika now both have their own crates strapped into MUTT MVR. Then--We had a red metal dolly that could convert from a furniture-moving upright to a 4-wheel thingie. 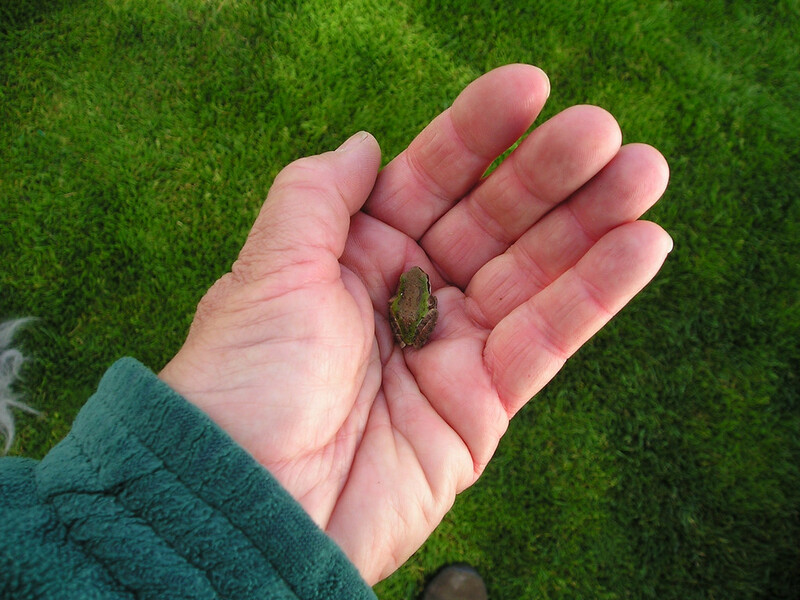 Tiny wheels, tiny dolly, very heavy and very difficult to move across, say, gravel or grass. I scoped out what was available over several years.I love the huge metal carts in brilliant powder-coated colors with huge wheels and folding handle, but they are huge and I don't have a lot of room, plus they are expensive. The basic wire or tubular crate-sized carts that people pull don't work well with my problem back & shoulders and the wheels aren't the best over rough terrain. Now--I saw the light when a friend showed up with a light-weight folding dolly with an extra-deep shelf. That was what I wanted! But also expensive. I was delighted when, at a flea market one weekend, I found a guy selling his, nearly new, for practically nothing. (Looks something like this.) Have used this for several years now. Then--I didn't own a crate and didn't think I wanted to. At my first seminar, I planned on just putting Rem in a chair like I did in class. But when I arrived--everyone else had a crate or an x-pen! Doh! 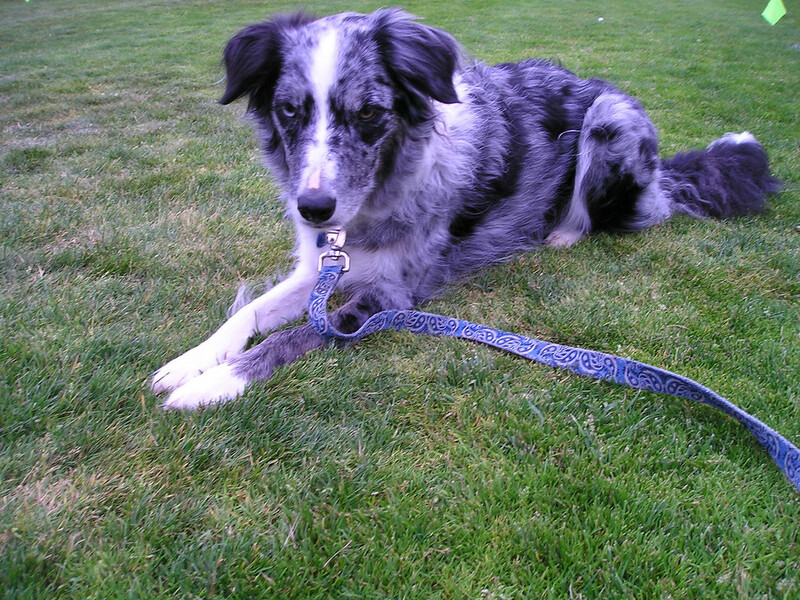 I think the instructor loaned me an x-pen and noted that my leash/chair plan wouldn't work at a trial. So I went out and bought a huge x-pen "so he could move around." It was really heavy and space-consuming in my Legend. Then--Oh, yeah, we had the usual pile of random long bungies in a box in the garage. After a couple of trials, I started taking the box with me for the trial, futzing with long bungies, then putting the box away afterwards. I saw that people had metal clips that they used for various things, and we had a couple of old metal clips in the garage that I'd likewise borrow for the weekend. Now--I have a bag full of metal and plastic clips of various sizes (some even blue and purple) that I've bought through the years and stay exclusively with my dog stuff. Same thing when I discovered loop bungies: have a whole bunch of different lengths on a clip, and some straight bungies (purple) that I bought specifically to go with my dog stuff. 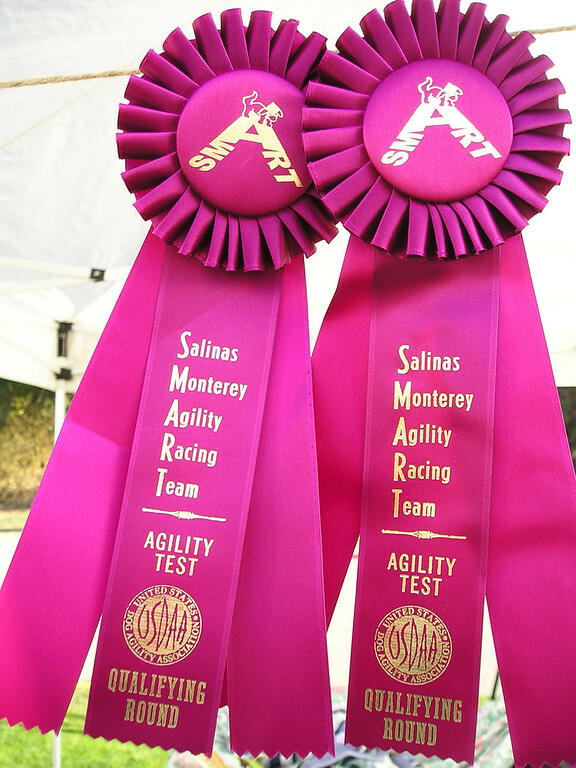 SUMMARY: To agility trials we go. My dad looked at my online weekends calendar and asked how many miles I put on MUTT MVR each year. Because I don't have a regular commute, I always say that most of my annual mileage (12,000-15,000 miles [19,000-24,000 km]) is dog-related. But is that so? Vet. At least one per dog for check-up and shots. Usually at least a couple more for various reasons--pick up a prescription, medical issue, whatever. Let's say 6/year, 17 miles round trip=about 100 miles. 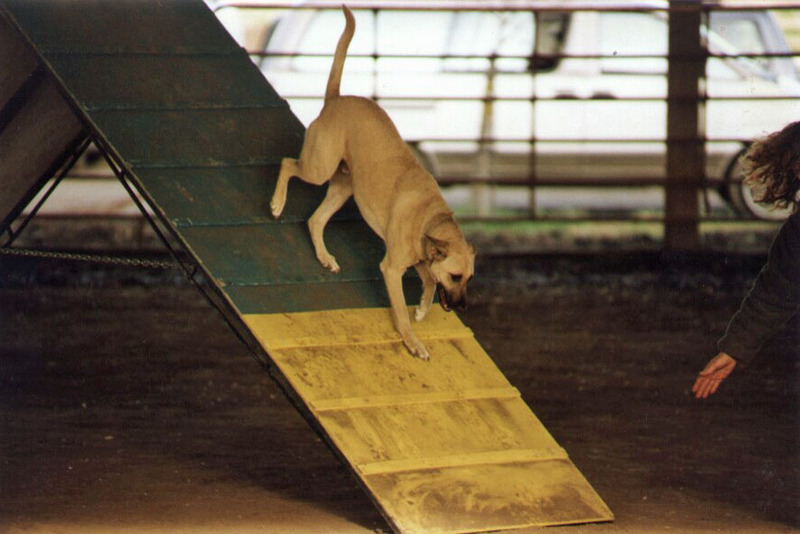 Agility class. We don't really have class once a week (holidays, rain, instructor out of town, etc.) but with extra trips to rent the field, get a private lesson, and so on, let's say 52 weeks a year. 26 miles round trip. 1350 miles. Competitions. In the last few years I've not gone to trials that take more than 2 hours to get to (other than Nationals). That's still at least 20 weekends a year, including occasional fun matches, seminars, and what-not. There are either the 2-hours-away trials, in which case I don't come home to sleep saturday night, or the 1-hour-away trials, in which case I do come home Saturday night. Either way, the mileage for a weekend is probably about the same. Say, 200 miles round trip. 4000 miles. If you throw in a trip to Nationals in Scottsdale (heh--that's not happening any more, thank goodness! ), that adds another 2000 in one week. But didn't go last year, and I'm not going off to the more eastern parts, for sure. Well, lessee, that's only 5500 miles [8850 km]. I don't go to the groomers; pet food is usually picked up on the way by the store--huh. 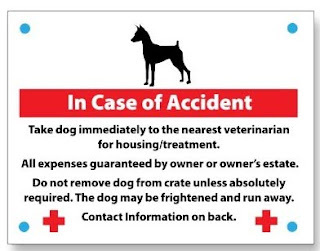 Might make special trips here or there for dog things, but nothing immediately pops to mind. Still, that's roughly a third to a half of my annual miles. And there you have it: The whole reason I have a minivan instead of a nice sporty or luxury car. Dog travel. That is, it is indeed a MUTT MVR. SUMMARY: Wikipedia does it again. Anyway, many of my breed photos are still used in articles, even though many are nothing to write home about (leashes very visible, etc.). And they are all still ON wikipedia even if not being used. 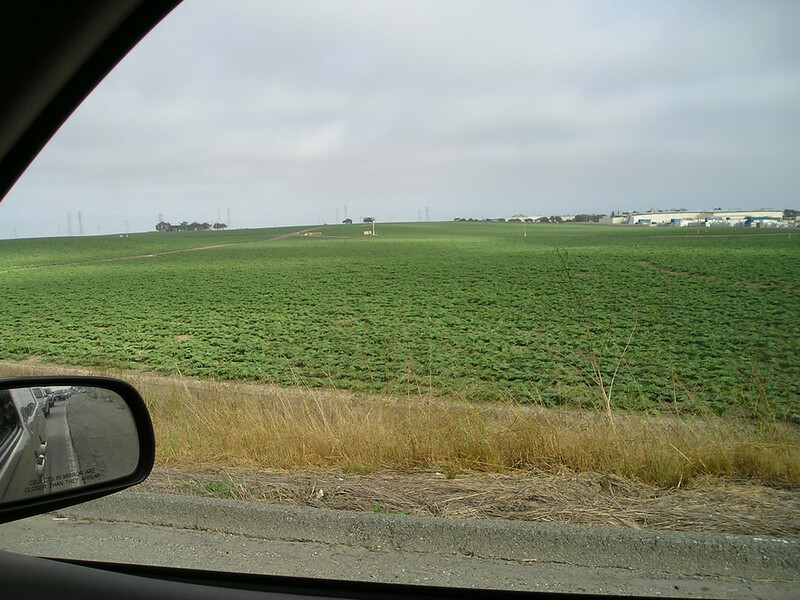 Photos from wikipedia are quite popular. By publishing them there, I allow other people to use the photos (basically for noncommercial purposes) if they give credit to me and a link back to where the photo exists on wikipedia. People don't all seem to bother with that, so my photos are all over the web now, sometimes even with other people's copyrights watermarked on them. I got tired of chasing those down and asking them to fix them, too. 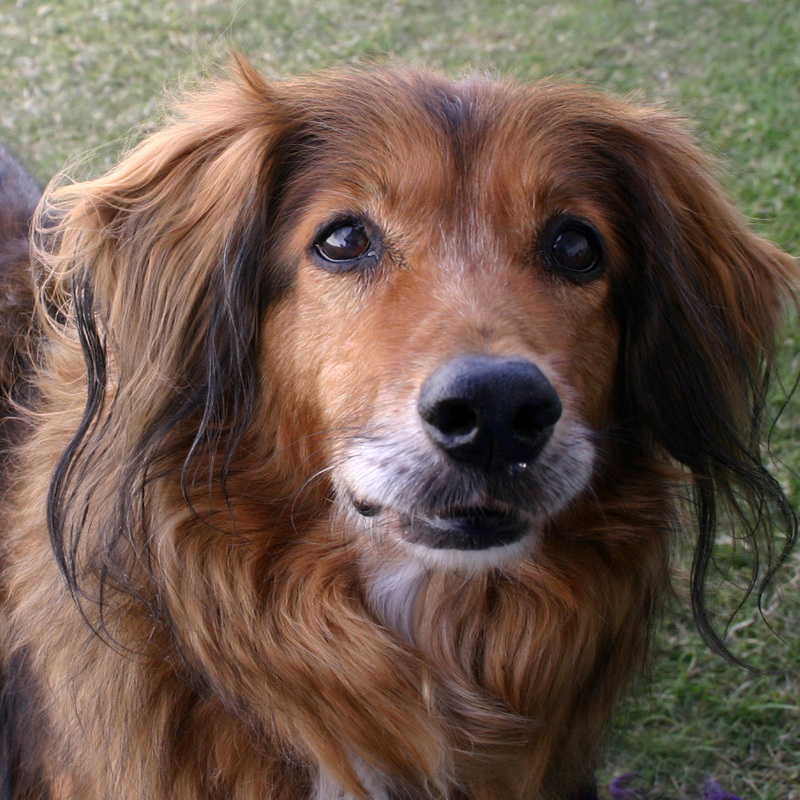 "smooth collie" or "collie dumbbell", a smooth tricolored collie with a dumbbell in his mouth, on a field of grass, facing left (sometimes right, when they've reversed the photo). 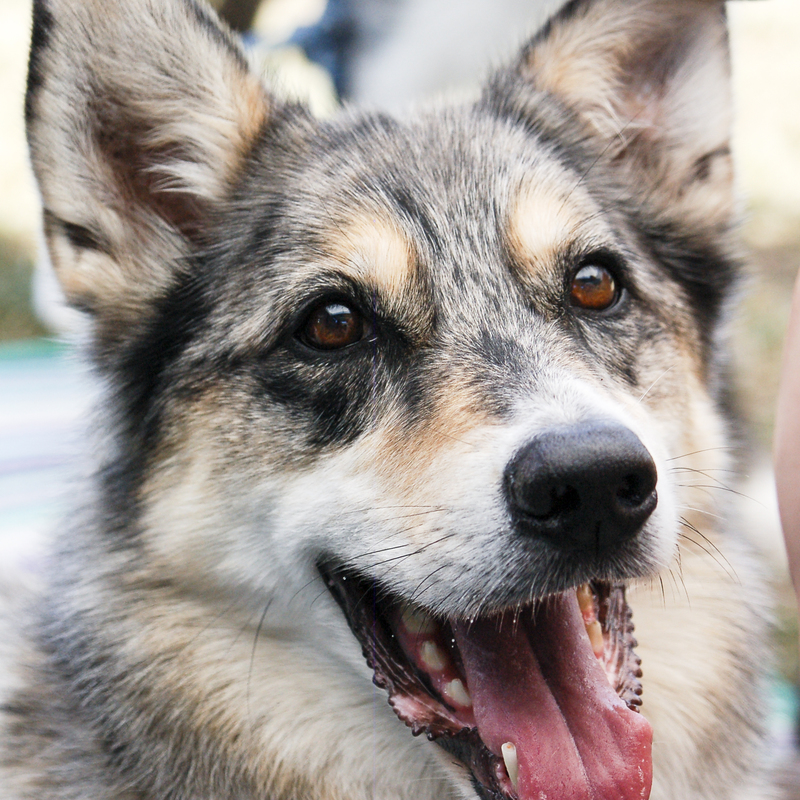 That's my photo of my agility friend Rowan. 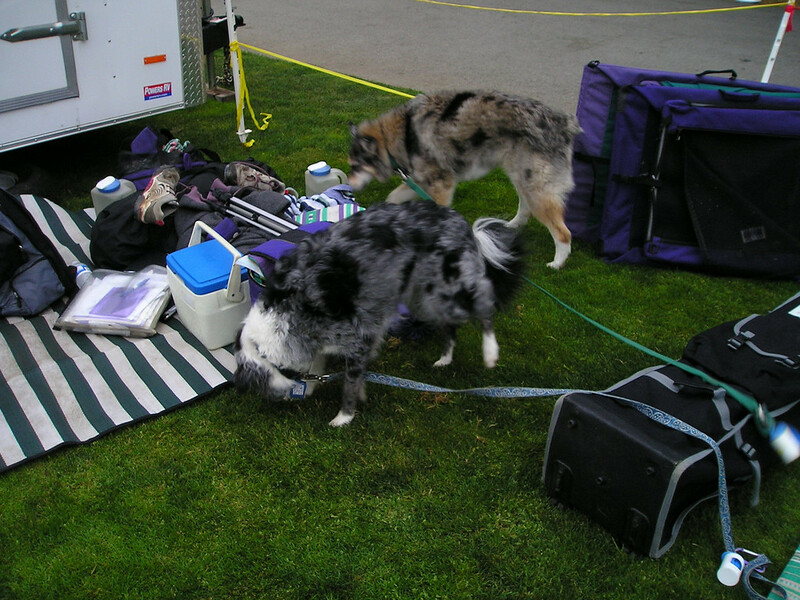 "rat terrier", there's an angled full body shot of a rat terrier looking up, with a purple leash coming out to the foreground. My photo. "australian kelpie", red and tan guy, side view, with him looking out at you, leash going off to the side. Mine. "boston terrier", side view with him looking slightly at you, brindle and white, grass background. Mine. "cavalier king charles spaniel." Sitting on a wood surface (actually it's a picnic table). Mine. "clicker training." A hand holder a clicker, looking down at the hand and at a sitting dog who looks remarkably like Tika. Oh--wait--it IS tika! Surprise, another photo of mine. I'm no longer bothering to check whether these are legally copied. You can see all my wikipedia dog photos here. I've made three or four sales of photos based on ones that people found on Wikipedia. So now, last week, I just received a mysterious package, from someone i'd never heard of, containing a book I'd never heard of, on a topic I'd never pick up a book about on my own. But, leafing through it, it occurred to me to check the photo credits: Oh, yeah, a couple of years back, this guy actually emailed me about using one of my photos. So, in this book, on page 44, next to an image of a dachshund from a hundred years ago, is my photo of this miniature dachshund. To be polite, I started reading the book, The Origin Then and Now, by David N. Reznick, from Princeton Press. I'm only about 3 or 4 chapters in, including intro and background and such, and it is in fact readable and interesting. I'm not sure whether I'll make it all the way through, but so far, so good (I just don't have patience or time for dull or badly written material). I'm proud to be part of this project and to have my name listed in the photo credits.